THE American-Pacific islands of Hawaii are fast becoming known for their reggae music as they are for their natural beauty and idyllic charm. Acts such as Maoli, Rebel Souljahz, SOJA and J Boog are well-known on the international reggae stage. Add to that list, the band The Green. 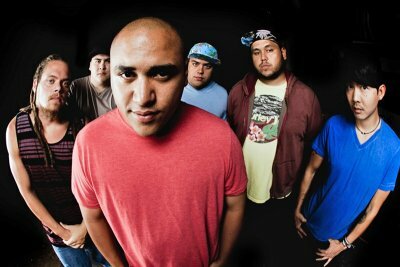 Formed in 2009, The Green comprises Caleb Keolonui (vocals), Ikaika Antone (keyboard, lead singer), JP Kennedy (guitar, vocals), Zion Thompson (guitar, vocals), Brad 'BW' Wantanabe (bass, keys), and Jordon Espinoza on drums. This band has been steadily holding its own and even outselling traditional reggae acts. This is not lost on lead singer Antone. "Without traditional reggae music, we wouldn't have been able to be doing what we are doing. We have the utmost respect and love for this music. We studied reggae music, learned how to play it, performed as backing musicians for many Jamaican reggae artistes that came through Hawaii, and because of that learned even more about how to play reggae from them," he said in an interview with Splash. 'Edge' makes the singer uncomfortable as he sees it as having one up on the elders or reggae. "If you're referring to why US reggae acts seem to be selling better than traditional reggae acts, then I would say I think it's because reggae music in the US and even in other parts of the world has evolved, and the evolution of the music is what the younger generation is listening to. The generation now is growing up listening to bands like Rebelution, SOJA, and Iration. Their discovery of reggae music is now bands from the US. When I discovered reggae as a child, it was artistes from Jamaica, such as Bob Marley, Yellowman, and Half Pint. That is the impact that reggae has made," said Antone. The singer summed up the band's love affair with reggae music with a quote from Damian 'Junior Gong' Marley's song. "Affairs of the heart, together we've grown, if ever apart, all I want you to know, is your love is life-changing, and I wouldn't be the same with you, your love is life-saving, you always catch me when I fall." This, he said, epitomises what reggae music has provided not just for himself, but for so many others who rely on reggae music to lift their spirits in times of hardship and pain. "It has changed my life and the others around me; I wouldn't be who I am without it," he said. The Green is now looking forward to kicking off their fall tour, which will begin on November 11. Performing alongside J Boog and Eli-Macthe group will travle to 18 American cities. The Green will be releasing some new music very soon. Its last project was a full-length album entitled Hawai'i 13 released August 2013 for Easy Star Records. In 2010, the band released their self titled album earning both critical and commercial acclaim and was awarded the iTunes Best Reggae Album of the Year.